Hello Friends! I hope you are enjoyed your weekend. I’ve been doing a little watercoloring and I wanted to share one of my projects with you. 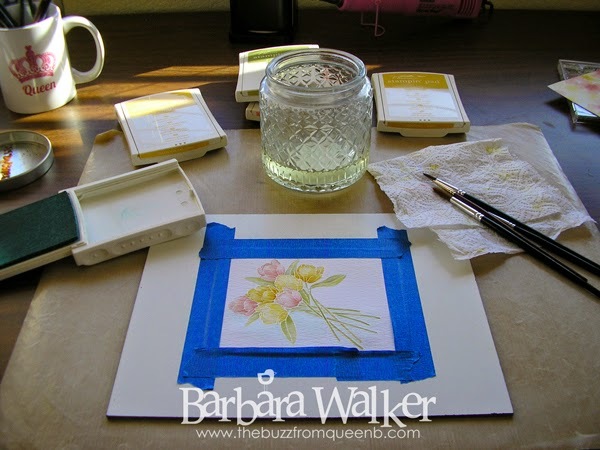 I have watercolored these tulips from Papertrey Ink’s Friendship Jar Spring Fillers many times. But, I have fallen in love, and I do mean LOVE with using Stampin’ Up ink pads for watercoloring and I wanted to try something that I had rolling around in my head. Let’s get right to it! I drew inspiration from a piece of Designer Series paper. 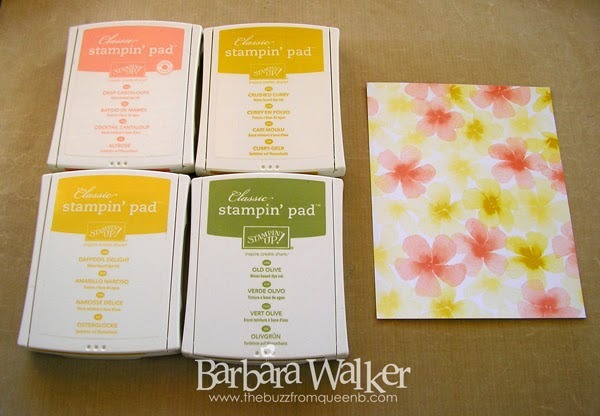 It’s called Watercolor Wonder and it’s from Stampin’ Up! What’s nice about this, is that I have ink pads to coordinate with the colors in the paper. I stamped my image onto the textured side of a piece of Tim Holtz Distress Watercolor Card stock, using Versamark ink and sprinkled on some WOW White Pearl Super Fine embossing powder. I heat set it with my heat tool and let it cool. Then, came the fun part…the watercoloring. 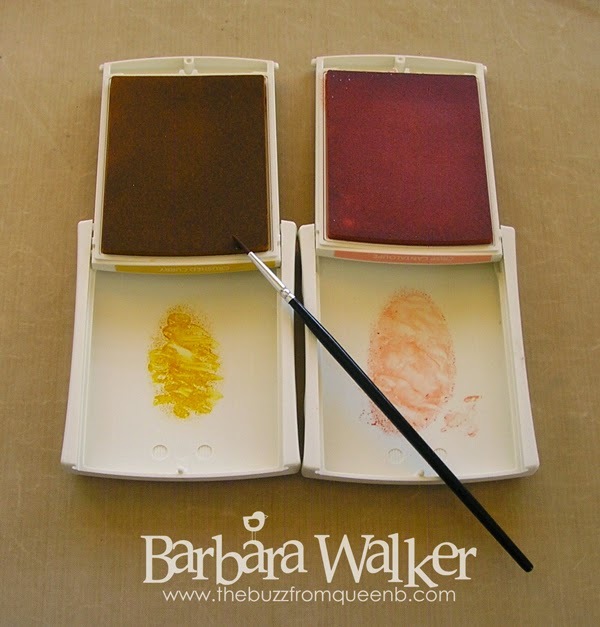 I squeezed the closed ink pads to transfer some ink into the lids and I used them as my palettes. If you don’t want to get your lids dirty, just smoosh some ink onto your craft sheet or an acrylic block. Both work just fine. I used several sizes of watercolor brushes. I needed different sizes for different areas. A “0” for small tight areas and adding shading, a #2 for the blooms and leaves and a #4 and #6 for the blue background. Just a note here, I’m no watercoloring expert, but I learned from those who are that, it is of utmost importance to the end result of your project, to invest in quality paint brushes. I purchased a nice set of brushes from Simon Says Stamp. And then I filled in the gaps with brushes from Michael’s. I use a 50% off coupon to help defray the costs. I can tell you, I have used inferior quality brushes in the past and there really is a difference. Now, I get no shed bristles and they hold water better. Okay…back to the card. Loooooong winded Barb today! As usual, I taped my piece onto a watercolor board to help prevent warping. Even though the embossing powder traps the color into separate sections, I still colored blooms that were not touching each other first, just in case I got a little wild with my brush, I wouldn’t ruin anything. I didn’t use much water on my brush, so the drying time was not too long. And, as usual, I let my piece air dry. After everything was completely dry, I added a little pale blueish green ink around the image to ground it and to help the colors pop. I matted the focal panel with a piece of my inspiration patterned paper and mounted it onto my card base with dimensional adhesive. Then, it was time to embellish! I pulled out an old set of tag dies and cut the little circle. Then, using the Card Word Puzzle stamp set from Close to My Heart, I stamped the greeting with Memento Peanut Brittle ink. I glued that down with liquid adhesive and added the bitty bow with a glue dot. I had sequins on the card at first and then thought I would try pearls to bring out the pearl embossing powder. I finished off the inside of the card with a sentiment from another Papertrey Ink stamp set, Heartfelt Basics. I've used this a lot, too during my Mother's Day card series. 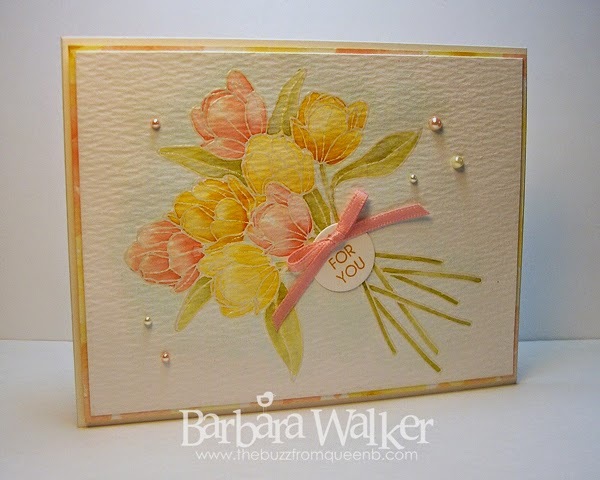 I also used the "Happy Mother's Day" sentiment from the Spring Baskets stamp set from Waltzingmouse Stamps and a butterfly stamp from WPlus9. I used the Rock and Roll technique on the butterflies. I inked up the image with Crisp Cantaloupe ink, then rolled the edges of the wings in Crushed Curry ink. Then I went over them with a Clear Wink of Stella glitter brush marker. I added a small strip of the inspiration paper on the bottom of the panel for continuity and then I matted it with Crisp Cantaloupe card stock and my card was finished. 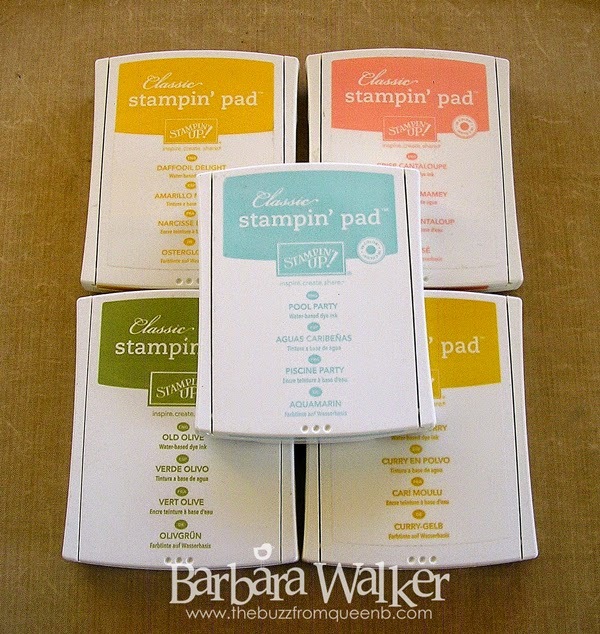 Ultimately, I ended up using several Stampin’ Up! Inks for this project. As I stated in the beginning, I am really impressed with the results I am getting from these inks. I like that they keep their vibrancy and yet, can be watered down to be very pale. I used only the inks pictured below to watercolor my image. I just used the colors at different strengths to get the look I desired. I also like that I can use the inside of the lid as my palette. This makes it super easy to watercolor on the go. I can just grab the ink pads I need and a waterbrush and be off. Generally, I am not a fan of using the waterbrush, but I think it’s the best bet for travel mode watercoloring. So there you have it! Lots of pictures in this post but, since I’m not set up to do videos, I thought it would be helpful to show pictures of my process. I hope you enjoyed having a little peek into what goes on in The Hive. 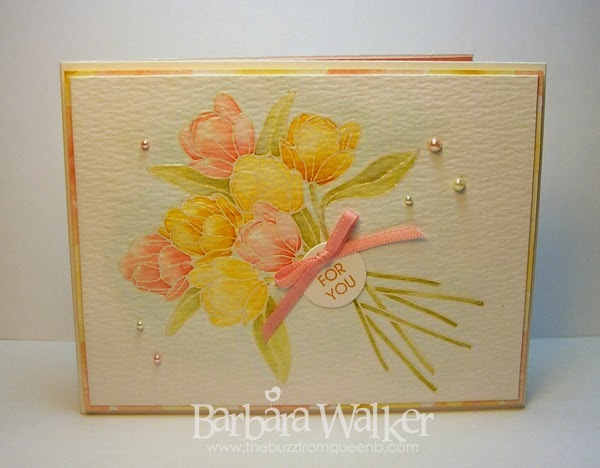 Gorgeous work, Barb! 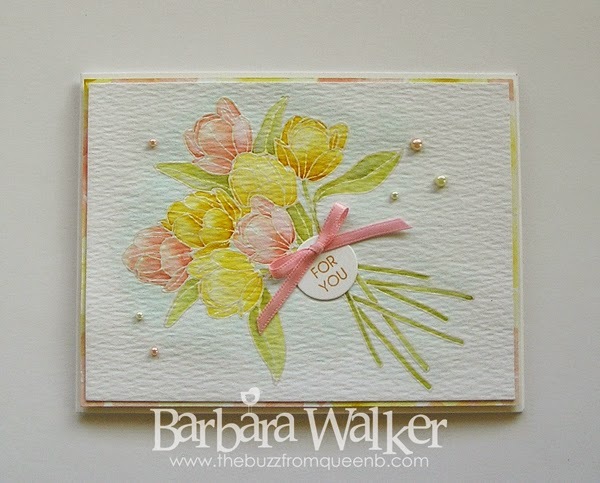 I adore the soft colors you achieved and what a happy surprise that the Stampin' Up inks work so well. I hear you loud and clear on the quality brushes. I have several from my old tole painting days, but I still bought a new set when I started attempting to dabble in watercoloring. The pearls instead of sequins adds a wonderful elegant quality. I just love how you finish the inside of the cards you make as well. Lovely work!